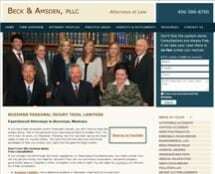 Beck, Amsden & Stalpes PLLC is one of Montana's most respected personal injury law firms. The Firm enjoys the highest legal rating for ability and integrity as determined by fellow attorneys and judges. The Firm has the reputation, qualification and strength to successfully represent persons or entities harmed through the wrongdoing of others. The Beck Law Office opened on January 2, 1982, in Bozeman, Montana. The law practice concentrated immediately upon serving and representing injured workers, consumers and small businesses. No other law firm in Bozeman at that time specialized in representing persons disabled by the wrongful conduct of others. Throughout the 1980's, the Firm represented hundreds of consumers and injured workers in front of administrative agencies, state and federal courts. The Firm practice concentrated primarily on employees' rights, workers' compensation and personal injury litigation. The law practice flourished during the 1980's by referrals from other clients and widespread publicity on successful trials in district courts. In the 1990's, the Firm began representation of individuals in highly publicized cases. For example, the Firm represented a rural Montanan who contracted AIDS while receiving a blood transfusion in a Portland hospital. The case garnered nationwide attention with Mr. Beck appearing on programs such as the CBS Morning Show, NBC Dateline, and the PBS series Frontline. Some of the Firm's cases have had a profound effect on the law of Montana, including cases which established the right to compare the plaintiff's negligence with the combined negligence of all defendants in a case (North v. Bundy); the right not to have a verdict rendered against a person who is not a defendant in the case (Newville v. Dept. of FS); the right to receive information from corporate defendants regarding other injuries caused by similar defective products (Preston v. District Court); the right to exclude evidence of inflammatory, prejudicial and irrelevant collateral matters not going to the merits of the case (Durden v. Hydro Flame); the right to have a product defect case tried on the condition of the product rather than on the foreseeable conduct of the victim (Lutz v. National Crane); and the recognition of the right to receive compensation for emotional distress arising out of false accusation of theft and employment discharge (Niles v. American Eye Care); the right of railroad workers to receive disability benefits while working for a separate corporation under control by owners of a railroad (Watts v. Livingston Rebuild Center and Montana Rail Link). In each of these cases, the highest goal was to represent citizens in obtaining fair and impartial resolution of their cases. The Firm takes pride in the caliber of its attorneys. From 1986 through 1994, Monte Beck served on the Board of Directors of the Montana Trial Lawyers Association. In 1991, he was honored to receive the Montana Trial Lawyer of the Year award. Mr. Beck served as President of the Montana Trial Lawyers Association in 1993. John Amsden is a native of Montana who spent several years in commercial, securities and tort litigation in Southern California. The Firm continues to specialize in product liability, automobile design defect, environmental pollution cases, medical negligence, insurance claims and railroad and aviation liability. The Firm is committed to the right to jury trials and the rights of all citizens to seek redress and justice under the laws of this state and the nation. It is also committed to upholding the highest ethical standards, honor and dignity of the practice of law. The Firm welcomes referrals and associations with attorneys and law firms whose clients need specialized, aggressive and reputable representation in catastrophic injury, death, and complex business and environmental litigation.